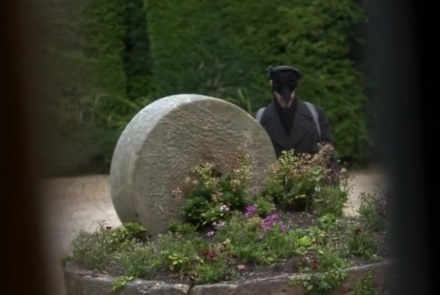 I still haven’t got round to watching any of the new Father Brown series, but Wednesday’s post reminded me of an unusual and instructive error that cropped up in episode 8 of the last series, The Face of Death. 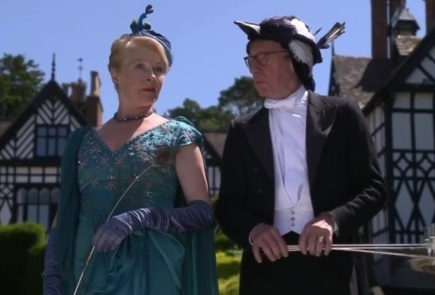 Some background: posh Lady Margaret kills a man with her car, and the victim’s son vows revenge on her and her husband, the rather wet and feeble Professor Galloway. 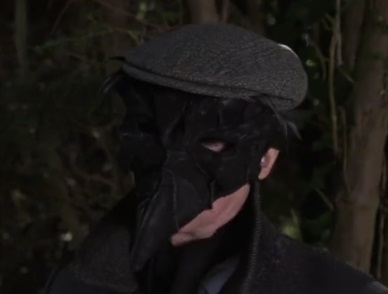 The Galloways hold a masked treasure hunt at their estate, during which a man wearing the same mask as Professor Galloway is killed. Professor Galloway tells the police that he’s worried that he was the intended victim. Later, the masked killer shows up again outside the Galloways’ window. Professor Galloway hurries his wife into the bedroom, promising to confront the killer. Outside, Professor Galloway bumps into Father Brown, who has just driven up to the house. The killer has vanished. Father Brown and Professor Galloway search the grounds. But when they re-enter the house, they find Lady Galloway has been murdered. The solution: Professor Galloway is the murderer. The masked figure outside the window was just a coat and mask on a dressmaker’s mannequin, stolen from his daughter. He tried to make it seem like he was the intended victim in the first murder to divert suspicion, just like in every other mystery where the wrong person seems to have been killed. That particular bit of plot cribbing aside, the real problem is the alibi with mannequin. It’s pointless. At the risk of sounding like a real Father Brown story, an alibi needs three parties to work: someone to acquire the alibi, someone to confirm the alibi, and someone to believe the alibi (although this last person can be the same as the second person, or often a broad group of people like “everyone else” or “society”). Professor Galloway sets up the dummy in the garden. He gets his wife to look at it. So at this moment she believes he has an alibi. But she’s the victim! She’s the one person who doesn’t need to believe his alibi. Once he’s bashed her on the head, there’s nothing but his word that there was a man outside the window, and the whole rigmarole is pointless. Now as it happens, Father Brown arrives and gets to talk to Lady Margaret before she’s killed. But Galloway doesn’t know that’s going to happen. In fact, he’s incredibly lucky that Father Brown doesn’t turn up earlier and spot the mannequin in the garden. Galloway’s plan is solely to create an alibi to fool the audience, who the authors have forgotten aren’t actually characters in the story. This is less unusual than you’d think. Overrated Christie classic The Murder of Roger Ackroyd, recently voted the best detective story of all time(! ), makes exactly the same mistake. The killer sets up a complicated alibi, but it’s only through sheer luck that anyone is around to confirm it. When the killer makes their plan, as far as they know the situation will be the same as in the Face of Death: just the killer, the victim and the mechanism for the alibi. But there’s no point in having your victim being the only party to your alibi! Unless, of course, you’re actually just a character in a detective story written by someone who hasn’t thought things through properly.